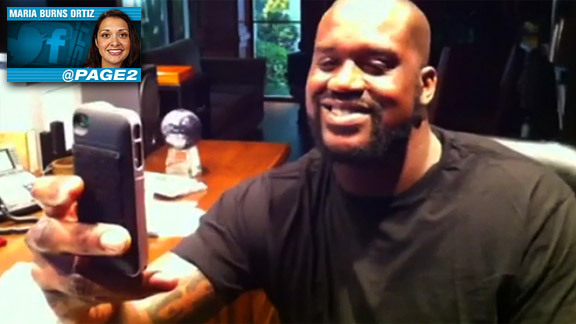 Amy Jo Martin Amy Jo Martin records Shaquille O'Neal as he posts his announcement on Twitter that he's retiring. The first account verified by Twitter belonged to Shaquille O'Neal. Considering the NBA legend's status as a pioneer in the social mediasphere, that fact is not a big surprise. The second verified account isn't as easy to guess. "There really wasn't any kind of verification process prior to Shaquille O'Neal joining Twitter," Amy Jo Martin recalled. "In an effort to show that it was really him, [Twitter] started to do that verification checkmark. His account was the very first to have that check. My account was the second, kind of in addition with him." Courtesy of Amy Jo Martin Amy Jo Martin advises teams and players on how to use Twitter to their advantage. Although her name might not be familiar, pretty much anyone who has engaged with a team or athlete on social media has seen her work. Martin has been a driving force in the world of sports and social media, working with some of the biggest names and brands in sports. Not to mention that she has nearly 1.3 million followers on Twitter. From working with the UFC to develop its social media incentive program to helping Shaq orchestrate his retirement on Tout, Martin and her company, Digital Royalty, have been a front-runner in social media revolution. "Shaquille and I kind of joke we were the Christopher Columbus of social media," Martin said of her first client. "We're kind of out on a boat by ourselves going through these uncharted waters. But it's become more understood, embraced and accepted, and now it's pretty much expected by fans for athletes, leagues and teams to be there." 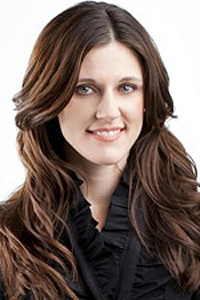 Martin's foray into sports social media came as director of digital media and research for the Phoenix Suns, a position she held from 2007 to early 2009. That was back when, as Martin puts it, "I would mention Twitter in meetings, and people would give me funny looks." When O'Neal joined the team in 2008, Martin set him up with a Twitter account. It was a natural fit for the athlete whose personality is as big as he is. As social media exploded, Martin saw an opportunity. She left the Suns and started Digital Royalty in spring of 2009. The company helps clients develop digital and social media strategies to effectively reach and engage audiences. The company also offers social media training for clients, as it did at the recent UFC Summit in Las Vegas. The training sessions cover everything from understanding the role of social media within a company's overall operations to the importance of engagement to the basics of what makes a good tweet. Education is essential, but buy-in from the top down is just as important. "A league needs to empower athletes, and that education has been embraced at different capacities," Martin said. "More traditional leagues have been sort of fearful to provide that level of training to athletes. In some cases, they're playing not to lose instead of to win." To Martin, social media training just makes sense as teams already are providing traditional media training. And she acknowledges that teams and leagues have begun to accept social media as an integral part of the sports landscape. Still, finding success in social media is not just about embracing the space as an inevitable part of business but also about turning it into an effective brand-building tool and finding ways to monetize it. For example, the UFC has been able to promote fights and events via social media when it previously had to spend money on advertising. As Martin's diverse client base shows, there is no one-size-fits-all approach. "It's definitely an advantage to have that outgoing personality," Martin said. "But there is also something to be said for just understanding the value an athlete brings." "He has a very different personality from the Chad Ochocincos, Dana Whites and Shaquille O'Neals of the world," Martin said. "He's still very successful in social media. He understands the value of it. It can come in the form of education, entertainment or communication [with your audience]. Those are all things that have to be considered. If you can deliver value, your influence will increase." The power of that influence was never more apparent than when O'Neal retired via social media earlier this month. "It was a pretty epic moment in my life because Shaq became the media that day," Martin said. "He had full control of when, where and how he wanted to make that announcement. ... It was his own words. No press releases needed. It was about him using this influence he had built to communicate directly with his fans. It's just proof that the last several years -- the time he spent to build his audience, his engagement -- really paid off." More than that, the event marked the next step in the evolution of sports and social media, with Martin and O'Neal once again leading the way. Cleveland Indians closer Chris Perez opened a Twitter account in 2009, but he didn't become active on the site until last summer. The impetus for his renewed interest? He wanted to follow a fake Chris Perez. "I was following him and making sure he wasn't doing anything I didn't want to be associated with," Perez explained. "But his tweets were funny, so I kind of went along with it." The real Perez found that the more he tweeted, the more he enjoyed it and the more his followers grew. When Indians president Mark Shapiro told the players the organization was interested in expanding its social media presence, Perez already was using his account regularly. Perez's presence on Twitter made him the resident expert to his teammates. "Everybody was kind of new to it, so they'd ask me how it works," Perez said. "Things like, 'If somebody tweets me, does everybody see it?' & The first week, they were coming back to me with, 'What if I do this? Would this be a good tweet?' Now, they've kind of figured it out on their own." In a matter of months, the list of Cleveland pitchers using Twitter has grown to include Chad Durbin, Frank Herrmann, Vinnie Pestano, Tony Sipp and Joe Smith. With virtually the entire relief corps on the site, it was only a matter of time before a hashtag was born: #bullpenmafia. "I don't know how that kind of started with the mafia thing," Perez said. "I think it was one of our mutual followers. We just kind of went with that. We've been pitching well lately. It's something that solidifies us as a unit." Twitter also is a way for the players to connect with their fans, for better and for worse. "I told the guys coming in there's going to be those three or four guys that no matter what you do, they're just going to hate you and be a critic on there," Perez said. "But for all those people, there are 10 times as many on there because they're fans and they want to give you support." The site is also a good way to keep up with what's going on around the league. "I've found out about guys going on the DL before other guys on my team have just because I'm on Twitter," Perez said. The Women's World Cup is under way, and teams are taking full advantage of the ability to connect with their fans via social media like never before. The Football Federation Australia actually relaxed its social media policy so players could take full advantage of the online medium during the tournament. In addition to players tweeting, the team will be sharing exclusive behind-the-scenes content from Germany on Facebook, and several Twitter chats with players and coach Tom Sermanni are scheduled during the three-week event. The Globe and Mail of Toronto recently chronicled how players from the sixth-ranked Canadian team used Twitter to keep in touch with friends and fans while preparing for the World Cup. Golf Magazine has launched a social media initiative allowing voters to choose an ultimate "Fab Foursome." The tournament-style bracket allows users to choose their favorite casual and professional golfers in four categories: artists and entertainers, politicians and leaders, golf icons, and athletes. Users can vote on Facebook or via the magazine's website. The bracket includes a sweepstakes component, but what makes the challenge interesting is that the voters will determine the content for the magazine's October issue, with the winner of each category being featured in the magazine. The early overall leaders are Snoop Dogg, Warren Buffett, Rory McIlroy and Larry Bird. Talk about an interesting 18 holes. Got a story we should feature? Have a site we should check out? Who's on your must-follow list? Tweet me at @BurnsOrtiz. If your idea gets mentioned in this column, so will you. Follow Page 2 on Twitter at @Page2. Maria Burns Ortiz is based in Boston. Maria Burns Ortiz covers social media for ESPN Playbook. She began writing for ESPN.com in 2006, covering college soccer for ESPNSoccernet. Burns Ortiz: Inside Devils "Mission Control"